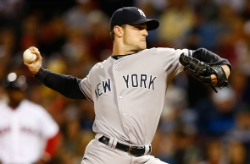 The New York Yankees defeated the Baltimore Orioles 4-2 today, and it was Shawn Kelley who earned the save for the Pinstripes, not David Robertson. After the game Joe Girardi told the media that Robertson will be placed on the 15-Day disabled list with a pulled groin. Kelley got Matt Wieters to fly out, Nelson Cruz to pop out and Steve Lombardozzi to ground out, and needed just 9 pitches to save the game. Kelley spent 4 seasons in Seattle with the Mariners to start his career before appearing in 57 games for the Yankees last season. For his career, he has 195 strikeouts in just 183.2 innings pitched and walked just 62. Those are good numbers. The bad number is the 27 home runs allowed which has led at 76 earned runs and a 3.72 ERA.